Keep every inch of your garage clean with our great selection of powerful pressure washers. 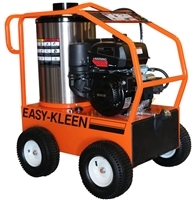 These machines are a traditional method of removing dirt and grime from any surface, using high-pressure water jets to blast gunk off of just about any type of floor or wall. While many people have come to accept occasionally renting a washer to get their space looking like new, simply owning your own is more affordable than you might realize. We have great prices on quality machines so that you can find the right match for your shop, and it will pay for itself in no time at all with money saved on rentals! 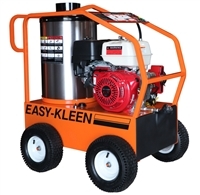 We have many different pressure washers and parts to help you find the right tool for the job. Both gas and electric options are possible, offering different benefits for you to consider. 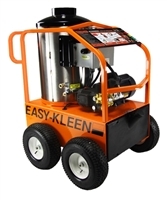 Gas machines are much more economical, being a great option for people who are looking for cleaning action without a huge price tag. They are also typically capable of more horsepower, providing the strength to tackle the toughest jobs. Electric machines are quick and easy to use while offering great portability, as well being more environmentally friendly. They are a much healthier option for use in enclosed spaces, such as smaller garages, so you will not be smelling gas fumes for hours. In addition to our powerful machines, we have a great selection of pressure washer accessories to help you complete your tool kit. Expand the capabilities of your washer with a gun kit that will give you different tips that will change the way you spray, giving you more patterns and more control over the amount of pressure you use. This is important for people looking to wash a variety of surfaces. Using too much pressure on soft surfaces can cause damage, so using a tip with a wider pattern will be important. We also have cleaning wands so that you can reach the hardest areas, allowing you to clean every inch of your shop without hassle. Find a great selection of high-quality equipment when you shop with us. We provide the best tools on the market so that you outfit your garage with the functionality to complete any task quickly and easily. Keep your space in top condition with less effort and time using our powerful machines!